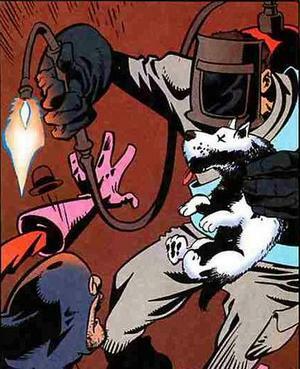 If I were to say that there was a Dogwelder superhero comic released by DC Comics, what would you think the strip was about? It’s a rather odd name, and it does make very little sense when only reading the title. Well let’s just say that we all make mistakes, and DC Comics are not immune from from the most human of conditions. DC Comics is one of the most well known comic companies in the world, spawning superheros such as Superman, Spider-man, Batman and so on. It’s hard to argue the success of these creations, and many others, but when they created the Dogwelder superhero comic, as part of a gang of 8 crime fighters known as Section 8. We will just say that it was a fail of gargantuan proportions. What was it that made the Dogwelder superhero comic so terrible? His method of fighting crime. When the more recognizable superheros that DC Comics has created fight crime they do it in a rather clean fashion. Sure there is violence, maybe even a little blood is spilled from time to time, but it’s not gross or cruel. What set Dogwelder apart from the rest was that he would combat crime the same way that his name is spelled. Yep, he would weld dogs, specifically to peoples faces. What were they thinking? Did the DC executives have some kind of psychedelic trip? God only knows, but this particular comic ticked all the wrong boxes. Now before anyone jumps up and down crying animal cruelty support we must point out that he would use only dead dogs, which I think would be a little better, but by far more grosser. It may have taken an insurmountable amount of skill to perform such a delicate procedure, but it was just wrong on so many levels. It was far from the typical crime fighting superhero we are used to. Needless to say, the Dogwelder superhero comic was a complete and utter failure. It was so bad that he was killed off in Section 8’s final battle by being vaporized by some kind of acid secretion. But this failure has left us all with a sense of what not to do when designing a superhero.